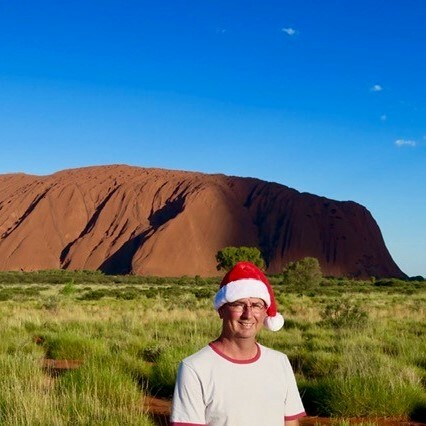 Fr Brian Mathews has a huge parish that takes in Uluru. From isolated outback mining towns to Queensland’s surf beach holiday spots, Australia’s parish communities are listening to the Spirit and preparing for Christmas. As the Inland Mission’s parish priest for the past four years, Fr Brian Mathews is looking forward to celebrating the last ever Christmas Mass in the local pub of the soon-to-be-closed mining town of Mintabie, more than 1100km northwest of Adelaide. The Inland Mission is a vast parish roughly the size of the state of Texas or about the same size as France and Spain combined. It includes the towns of Coober Pedy, Mintabie, Uluru, Marla, Oodnadatta, William Creek, Innamincka, Anangu Pitjantjatjara Yankunytjatjara (APY) Lands and Marree and, when Fr Mathews travels that way, Birdsville. Whether it is watching Uluru after a rainstorm or experiencing a desert sunset, Fr Mathews happily attends to the spiritual needs of his far-flung flock of around 200 parishioners who call the isolated mining towns and outback stations home. “On the Friday before Christmas, I will drive to Mintabie for Christmas Mass with the people there, a small opal mining town, which the South Australian Government is closing down, so this will be their last Christmas Mass in the local pub!” Fr Mathews said from his base in Coober Pedy. While many locals leave the inland area for cooler coastal areas at this time of year, Fr Mathews said a hardy group of parishioners and many children would stay and attend Mass. “In my travels around the parish I have met so many wonderful people either locals or travellers just passing through,” he said. “They have come to some of the most beautiful landscapes in our country, and the world, and at times Mother Nature puts on a spectacular show, especially after the rain. “To be at Uluru when it rains is truly a spiritual experience. No wonder it is so important for the local Aboriginal people. Fr Mathews joked it would be one of the few churches in Australia that is never locked. “Life in the outback is harsh, but the bush people are wonderfully hospitable – especially the station people who have been very kind to me as I’ve travelled around to visit them,” he said. “Opal miners never know if they will find opal or not. Some come and never find anything and leave with less than they came with. Others come and find millions. Meanwhile, on the Gold Coast, Burleigh Parish pews are expected to once again be brimming as their already large Catholic population swells with sun- and surf-seeking holidaymakers. “We have 52,000 Catholics in this parish – it’s the largest parish in Australia statistically for historical, lifestyle and all sort of reasons. We also have a lot of retirees who come from Melbourne and Sydney,” parish priest Fr Morgan Batt said. “Usually we get 2000 to 3000 at Mass, and at Christmas Mass attendance can go up to 5000 or 6000. Fr Batt said much preparation went on behind the scenes to ensure everyone felt welcome during the many Christmas Masses celebrated. “Our parish spirituality at this time has to ‘people of the crib’. We have to be people of hospitality. We need to be people of the inn – there has to be room. We will get so many people crowding in and the feeling is just extraordinary,” he said. Fr Batt said the children’s Masses last year saw many kids come dressed in costume – angels, Santas, Batman, Spiderman and one child even came as a cow. “The parishioners here are an extraordinary group of people who know what it’s like and just get on with the job. They know we’re going to have thousands and we might have to have 21 extraordinary ministers of communion. This entry was posted in Uncategorized on December 20, 2018 by ACBC Communications.